Review: "Omen: Eternal Black Dawn" - Sea of Tranquility - The Web Destination for Progressive Music! Old-school metal fans, rejoice! Omen's Eternal Black Dawn, along with Under A Savage Sky by Jack Starr's Guardians of the Flame (which both happen to be on the same label, Crash Music), is probably one of the most vintage-sounding metal albums released this year. Celebrating two decades as a band in 2003 � including an eight-year hiatus that lasted from the late-Eighties to the mid-Nineties � cult favorites Omen returns to the classic sound of The Curse on this album. The musical homecoming of sorts is bittersweet, though, as original Omen singer J.D. Kimball passed away from cancer on Oct. 3 � a month after the new record was released. Kimball left the band in 1987, and his most recent successor, Kevin Goocher, is all over Eternal Black Dawn. He penned the fantasy-tinged lyrics to all eight tracks (excluding a medley of older songs called "The Specter of Battles Past"), and his voice recalls that of both Kimball and Ronnie James Dio as he segues from operatic baritone to disgruntled growler. Founding guitarist Kenny Powell can still shred, and although he remains the only original member of Omen these days, the rest of the quartet still manages to gel with him. 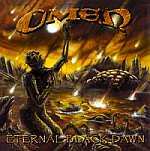 Eternal Black Dawn may not mark the beginning of a new era for Omen � the band's troubled history and a changing of the musical guard has already ensured it doesn't evolve beyond cult status � but it's nevertheless a heavy, melodic and testosterone-filled record that should please longtime fans and may even generate a few sparks with the young people, too.